• Sieve the contents of pack and mix with 125 water,and stir into smooth batter. • Pour into Gits Jalebi Maker or a thick cloth with small hole. • Heat 250g edible oil or Ghee into a shallow pan. Hold nozzle of the maker just above the surface of the oil, and squeeze to make circles with the batter, starting from the centre and sealing the end in the last half round. 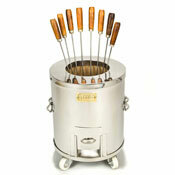 • Deep fry on a medium heat till crispy and golden. 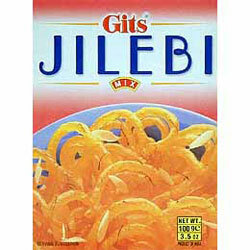 • Immerse jilebis in warm sugar syrup for 20 seconds, and serve hot or cold. Ingredients: Wheat Flour, Lentil Flour, Hydrogenated Vegetable Oil, Raising Agents (Sodium Bicarbonate, Citric Acid), Permitted Anti-Oxidants E320.